Knowledge creation is becoming more important topic for researchers and users in academic, management and industrial fields. The term has been widely used for the last couple of years, and refers to the formation of new ideas through interactions between explicit and tacit knowledge in individual human mind. To realise knowledge creation in real life, it is essential to transform human mind into computation in order to extract potentially useful information from data and create valuable knowledge. The use of intelligent techniques in computing-related fields can be useful to retrieve meaningful result in automated processes for knowledge creation. To bridge research activities between young researchers on Knowledge Creation and Intelligent Computing research fields, we cordially invite you to participate in The Sixth International Conference on Knowledge Creation and Intelligent Computing (KCIC). Started from this year, KCIC becomes more applied and sets a new name with International Electronics Symposium on Knowledge Creation and Intelligent Computing (IES-KCIC) 2019. IES-KCIC 2019 will be held in Surabaya, East Java, Indonesia, on September 27-28, 2019. 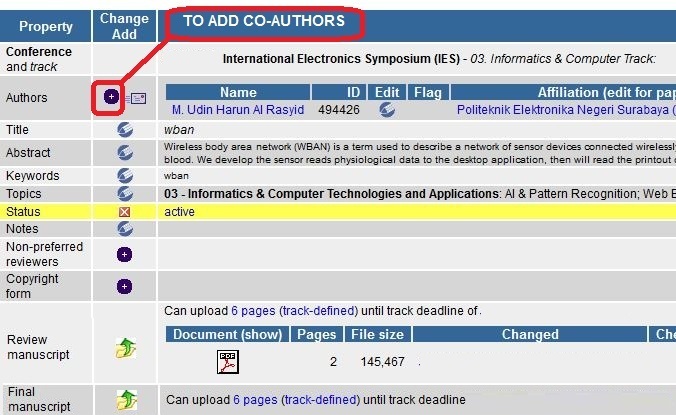 IES-KCIC 2019 is a technical co-sponsored IEEE conference and organized by Electronic Engineering Polytechnic Institute of Surabaya, and Keio University, and supported by some institutions. send an email to ies@pens.ac.id for confirmation with subject “IES2018 REGISTRATION” and write down your paper ID.